Chai Mitzvah Begins September 20! 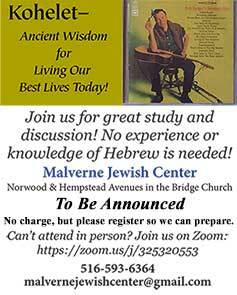 Connect with YOUR Judaism on YOUR terms! Our tradition tells us that an integrated Jewish life involves head, heart and hand … study, spirituality and social action. Explore all of these on your terms, with your personal interests through a new adult education initiative called Chai Mitzvah. You will participate in a monthly learning group with a specially designed curriculum that focuses on real life, relevant issues. You will choose an individual study topic that is personally interesting to you, adopt a new ritual or deepen an existing practice, and engage in a social action activity in the community. Then, at the end of the nine-month program, we’ll celebrate your journey! The program will begin on Tuesday, September 20, and be held on the third Tuesday of each month, except for October. The cost to participants is $36 for materials; scholarships are available. To become a Chai Mitzvah, or for more information, call Rabbi Elkodsi, 516-593-6364 or 203-332-4428, or email susanelkodsi@gmail.com. Go to the Chai Mitzvah website (www.chaimitzvah.org) to learn more.